Rabbis ordained by the Shalom Hartman Institute and HaMidrasha at Oranim after studying in the Beit Midrash for Israeli Rabbis, which is developing pluralistic and egalitarian spiritual Jewish leaders in Israel, will be speaking at Toronto, Boston and Westchester, NY, synagogues in March and May on how they are succeeding at breaking down Israel’s rigid religious barriers and boundaries. 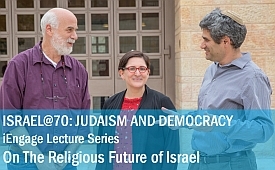 The focus of their talks, to be delivered in panel discussions, lectures, study groups, and private sessions, will be “[email protected]: Judaism and Democracy,” an iEngage lecture series, with a special focus on religious pluralism. Rabbi Dr. Shraga Bar-On, who co-heads the program, said the visiting group views itself as partners with the North American community in developing pluralistic Judaism in Israel. “The rabbis emerging from our program are creating an Israel that will be meaningful and enriching also for North Americans and their children,” he said. Bar-On, along with Rabbi Avital Hochstein and Dr. Moti Zeira, spoke in Toronto and Westchester March 2018. The participants in the speaking tour are graduates of the Hartman Beit Midrash for Israeli Rabbis, developed by the Shalom Hartman Institute and HaMidrasha at Oranim. The program, now nearing completion of its second cohort, is cultivating a new generation of leaders who are reshaping the Israeli public sphere to reflect and respect religious pluralism in Israel and around the world. The program brings together voices showcasing the diversity of Israeli-Jewish experience to define an Israeli rabbinical leadership model for our times. More than 30 participants and graduates - men and women from a wide range of experiences and religious traditions - are already leading institutes and communities across urban and rural Israel.